Driven: Porsche Cayman 2.9 | What Car? No one wants to admit that they drive the 'poor relation'. 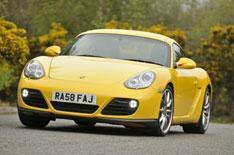 Brilliant though the standard Cayman is to drive, the faster Cayman S has always been the better car. The Cayman has traditionally been a little too (whisper it) slow. Not any longer. A new 2.9-litre engine pumps out a promising-sounding 261bhp up 20bhp on the old 2.7-litre unit. It sounds more than promising when you open the taps and it's fast. True, it needs plenty of revs to give its best, but there's decent pull from low revs, so it's undemanding to drive when you just want to get home. The new engine is also more economical and produces less CO2 than the old one, so the Cayman now sits three company car tax bands lower. Along with new front and rear lights, the face-lifted Cayman range gets modified steering and upgraded stability control. The result is a sublime driving experience: steering, handling, body control, brakes all are spot-on. You'll also appreciate the excellent driving position, the solid, classy dashboard and decent-sized luggage areas both in the front and rear. A word of warning, though: yes, the optional 19-inch wheels fitted to our test car look great, but they give the ride a nasty case of the jitters on a bumpy B-road. They also kick up too much road noise on coarse surfaces. You'll have to be picky to find many other downsides, though. It's not as well kitted as rivals, some of the buttons on the centre console are a little fiddly, and your left leg rests against the hard edge of the dashboard it should be padded. All those niggles disappear the moment you drive the Cayman, though. 'Poor relations' don't get much better than this.